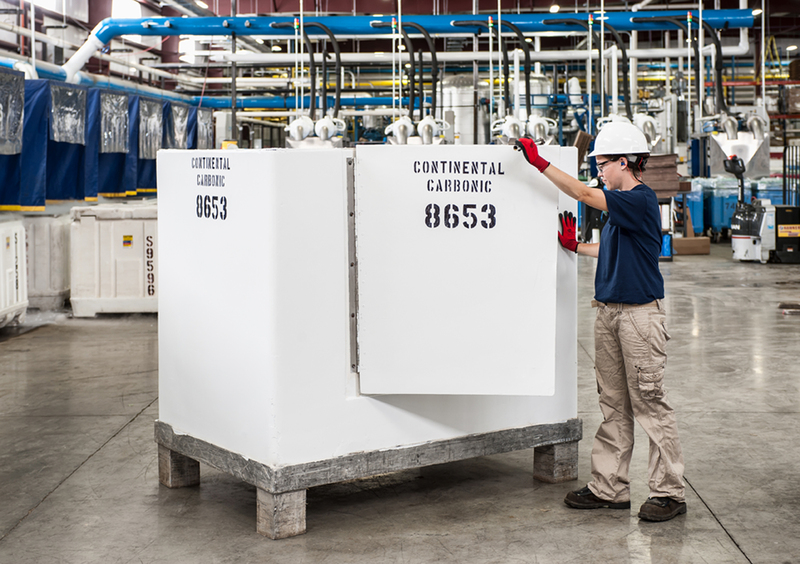 Continental Carbonic uses the following insulated dry ice containers to ship dry ice to our commercial customers. 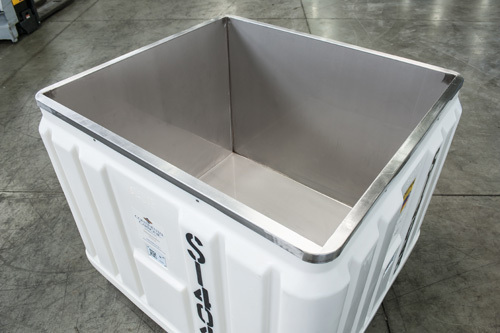 The stainless steel lined container is the workhorse of our commercial container offerings. Costing nearly three times an all poly container, the stainless steel container presents a much cleaner and safer dry ice storage option and also has the added benefit of reduced sublimation (3 to 4% per day vs 5% to 10% for all poly containers). All our food industry customers receive their dry ice in stainless steel containers. These containers hold approximately 1,400 pounds of pellet dry ice and 2,000 pounds of block dry ice. The container has a capacity of 30 cubic feet, weighs 243 pounds empty and has dimensions of 48" (L) x 43" (W) x 42" (H). 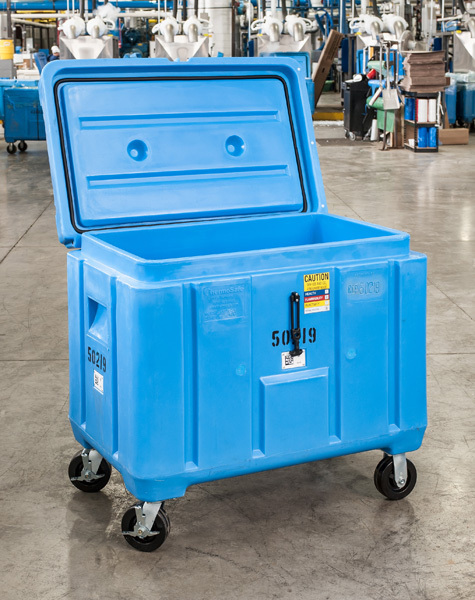 The HR 11 container is a great option for customers with smaller dry ice requirements and for those customers needing an easily moveable container. These containers are available with and without casters and have a hinged lid for better dry ice sublimation control. We recommend shipping blasting pellet in these containers as the lids can be tightly sealed to prevent dry ice clumping and sublimation. These containers hold approximately 500 pounds of blasting pellet dry ice, 600 pounds of regular pellet dry ice and 700 pounds of block dry ice. The container has a capacity of 11 cubic feet, weighs 106 pounds empty and has dimensions of 43" (L) x 28" (W) x 35" (H) (40" H with casters). Larger fiberglass insulated containers are used primarily for large block dry ice users. These containers have a hinged door on the front for easy access and provide good insulation for the large block user. These containers hold 96 solid dry ice blocks (maximum weight of 5,760 pounds). The container weighs 400 pounds empty and has dimensions of 68" (L) x 48" (W) x 63" (H). For one time large scale shipments of dry ice for emergencies or spot sales, we frequently use cardboard Gaylord containers on pallets. The advantage for the customer is that these containers do not need to be returned to us. The gaylords are not insulated so the dry ice sublimation will be higher. The Gaylord containers hold approximately 2,000 to 2,200 pounds of pellet.